Ashley Armstrong has been writing for LIVESTRONG.COM since 2010. She is the group fitness and personal training director for Fitness One in Norman, Oklahoma and is a certified personal trainer and indoor cycling instructor. She is also a Les Mills and Aerobics and Fitness Association of America aerobics instructor. She holds a Master of Science in Education in health and human performance from Baylor University. The hamstring muscles are generally an under-developed muscle group in the body, especially for women. The hamstrings are on the back of the leg and consist of three muscles: the biceps femoris, the semitendinosus and the semimembranosus. The hamstrings are responsible for the bending of the knee, maintaining balance and promoting correct posture. Weak and under-developed hamstrings can encourage you to lock your knees, causing too much curvature in the spine, according to My-Health-and-Fitness.org. Tight hamstrings can cause many physical problems such as muscle tears, decreased sports performance and most commonly back injury, according to SportsInjuryClinic.net. Stretching the hamstring muscles regularly is important to reduce the risk of back injuries and low back pain. The Cherry Picker exercise is one of several effective stretches for this muscle group. The Cherry Picker stretches the hamstring muscles effectively from a standing position. The exercise is performed in three stages and the stretch gradually deepens as your body warms up. It is important to warm up by increasing body heat and blood flow before stretching any part of the body, according to The New York Times. 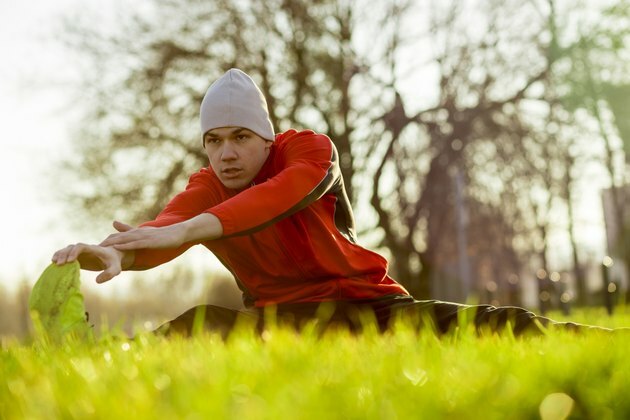 Stretching a muscle before it is warm actually reduces muscle strength and can lead to injury. To increase body temperature, jog in place or walk briskly on a treadmill, perform 20 to 50 jumping jacks, jump rope, or ride a bicycle. The warm-up can last two to 10 minutes. To perform the Cherry Picker, stand with your legs wider than shoulder-width apart, slightly bend your knees and hinge at the hip. Reach out in front of you, aiming to touch the ground. Then, reach directly below you and lastly, reach behind your legs. The stretch deepens as you reach behind you. Now stand up and perform the exercise again. Do this in intervals with other exercises or perform three sets of 15. The Cherry Picker can be more of an exercise than a stretch if you add weight. You can hold dumbbells, a bar bell or a medicine ball to make this exercise more advanced. The added weight causes your hamstrings to contract; stretching them, but also straining them. When performed regularly, the cherry picker can increase sport performance, improve balance and reduce back injury. Avoid ballistic, or bouncy stretching in this exercise because it can cause more injury. Aim for smooth movements. Consult with your physician before you perform any physical activity or stretching. This exercise might not be appropriate for pregnant women. Is it OK to Stretch in Early Stages of Pregnancy?